Greer brings a fresh perspective to timeless classics . . . with a little help from his friends . 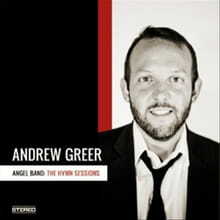 . .
Andrew Greer’s sophomore album finds the singer/songwriter in good company. He called in more than a few favors on Angel Band: The Hymn Sessions. Ten of the dozen tracks feature a diverse roster of artists lending their musical talent to eternal hymns handpicked by Greer—tried and true songs that have influenced his own spiritual journey. The only exception is the one original track, “I’ve Been Searching,” which fits in seamlessly tucked in between the timeless selections. Songs like “Never Grow Old” (with Regina McCrary and Marc Scibilia) and “Down by the Riverside” (with Julie Lee) possess a singable quality that will cause listeners to easily clap along. The latter of the two is a fun ditty that conjures images of candy-striped shirts and barbershop quartets with its whimsical musical backdrop. “In the Garden” is another quirky track where Greer gives the old hymn a complete makeover, save for the lyrics, and transforms it into a sprightly, Beatles-esque tune that would make John Lennon proud. Most of the other songs take a serious, worshipful tone. Arrangements are stripped down to simple acoustic guitars, strings and even the occasional banjo, giving many of the songs an Americana feel in the vein of Greer’s previous work. He makes these recordings his own with heartfelt vocals and unique twists on enduring lyrics. “Jesus Paid It All” is transformed into an old spiritual with the soulfulness of The McCrary Sisters and the simple foot-stomping melody, simplified so as to shine a spotlight on the Sisters’ rich vocals. Greer’s take on “The Lord’s Prayer” is one of the most ambitious hymns of the whole project. With the help of Ron Block, the simple, banjo-inflected instrumentation sets the simplistic tone to allow Greer to hold each note beautifully. “I Am Thine O Lord/Near the Cross” features Ginny Owens intertwining her soft voice with Greer’s in a poignant performance. Singer/songwriter Cindy Morgan joins him on the lovely “Turn Your Eyes Upon Jesus.” Her solo on the second verse is flawlessly stunning, complemented by the striking combination of their voices together. The album’s closer finds Greer all by himself with a peaceful, slow-winding version of “All Creatures of Our God and King” accompanied by both piano and organ. The entire album is a beautiful picture of what happens when friends come together to make good music. The hymns are stylistically different, but the messages are just as solid as the originals. Greer was astute at choosing a mixture of well-known songs and unfamiliar hymns. While eclectic, Angel Band is an album that will appeal to a wide variety of tastes. Greer shows that he is a rare breed of artist who has the ability to oscillate between genres effortlessly—contemporary, bluegrass, Americana, inspirational, worship—affording him creativity most artists wish they could pull off.